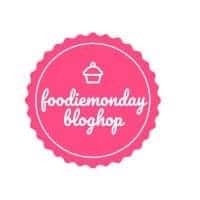 The Theme for the 180th Event of the FB Group, Foodie Monday Blog Hop, is Low Calorie Food. If you browse my blog you will see a number of salads, soups, rasams, kootu and other recipes that would comfortably fall in this category. I am however focusing on grain based salads now, and decided to go for something with Bulgar. Will the Real Levantine Tabbouleh Please Stand Up! 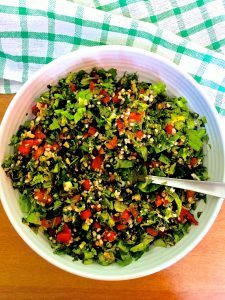 The Levantine Tabbouleh was a natural choice as I had fresh parsley, a packet of Bulgar, extra virgin olive oil, mint, tomatoes – everything I would need to make the dish. So the choice was easy, but the hard part came now. As I browsed blogs and my cookbooks, I realized that identifying an authentic recipe was going to be tough. There were 1000s of recipes for the Levantine Tabbouleh, all differing from one another is some way or the other. Some used cilantro. Others heaped up the Bulgar and added parsley and mint almost as garnish. Yet others had green chilies, some not. A few Recipes had onions, others shallots, and yet others scallions. And most claimed to be the perfect or authentic Tabbouleh or Tabouli, Lebanese, Mediterranean, Levantine. It was mind boggling. After all the research, I decided that the Tabbouleh was like the Rasam from my home State, Tamilnadu. Knock on the doors of 15 homes in Mylapore, Chennai, and you will get at least 30 different recipes for Rasam, all authentic, all delicious, all perfectly Tamilian. So each person had their own pet Tabbouleh recipe, just like the rasams in Chennai. As a food blogger though, I feel I have the responsibility to put out as close a version as is acceptable in the region where a dish is made, using ingredients too, as nearly matching the ones found there. One thing was clear. This was not, as I had mistakenly thought, a grain based salad. The true Levantine Tabbouleh, as all my reading told me, had just a little Bulgar. It was the Parsley that reigned over the salad, with help from the tomatoes. The rest of the ingredients including the Bulgar, were there to give ‘outside support’ as they say in political circles. I found that there were many types of Bulgar. In the Middle East and Mediterranean regions, it appears you get a fine grained Bulgar, which does not need to be cooked. You just soak it, usually in the juice of the tomato or other ingredients being used. The Bulgar I had on hand had clear package instructions to pour boiling water over it and let it steam within a covered bowl, for 10-15 minutes, just as I would make couscous. There are probably other variants which either need actual cooking, or soaking in boiling water for a different length of time, or used straightway without the need for soaking. 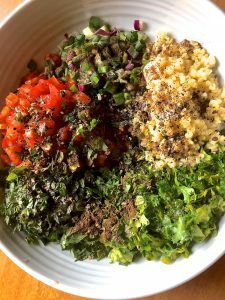 In this recipe for the Levantine Tabbouleh, I have therefore followed the package instructions for the Bulgar I had purchased, and the method would need to be changed according to the type of Bulgar you are using. Another question that came to my mind was – what parsley is to be used in this salad. Some recipes from popular chefs and home cooks swore by curly leaf parsley, and others equally firmly swore by the flat leaf one. When in doubt, go to the Master and so I turned to Yotam Ottolenghi for guidance on making the Levantine Tabbouleh. I have followed his recipe in the Guardian here, as to ingredients and proportions. A couple of deviations, not because I think I know more than the Master, but because of practical necessities – I ran out of the required volume of flat leaf parsley that Ottolenghi’s recipe specifies and made up the difference with curly leaf parsley from my balcony garden (sacrilege, I know, but by now I just wanted to make the Tabbouleh and be done with it). Another thing, Ottolenghi used shallots in his recipe. The other reliable source I had, Kamal Mousawak’s Lebanese Home Cooking, had scallions in the recipe. Well, I had spring onions and no shallots. So my recipe also has spring onions. Other than this, I have followed the recipe faithfully. 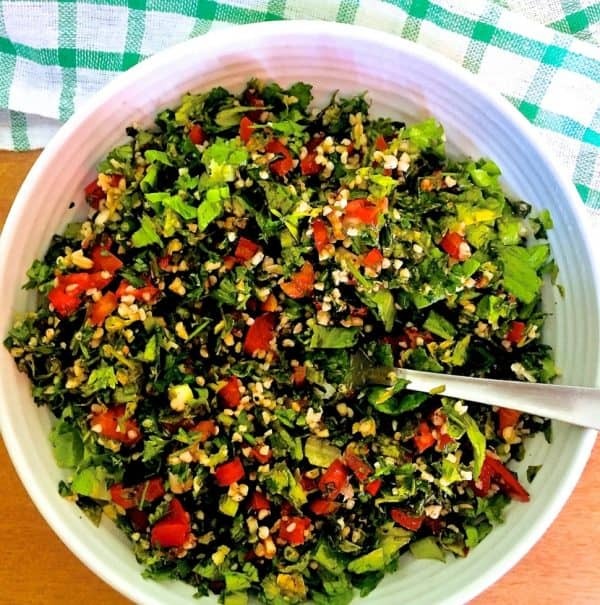 When you make this Levantine Tabbouleh or Parsley Tomato Bulgar Salad, follow the same proportions for the ingredients, as in my recipe, and you will get as close to Ottolenghi’s Tabbouleh as is possible. Some interesting facts about Bulgar and its health benefits may be found on HealthLine.com One serving of this Tabbouleh has 25 gms of Bulgar, which gives roughly 21 calories. The Olive oil, 40 ml for one serving, is about 300 calories. The theme for this week was suggested by Sujata Roy who blogs at Batter Up With Sujata. If you visit her blog, which I hope you will do, do look up her mouth watering recipes. I dream about the Orange flavoured rosagullas, and I hope to make them soon. Prepare the Bulgar as per packet instructions, or as per the variety of bulgar available to you. I used bulgar from a packet which said to pour boiling water (about 60 ml for 45 gm of bulgar), cover it with cling wrap and let it steam for 10-15 minutes. The water should be fully absorbed. Remove the cling wrap and add a teaspoon of olive oil. Meanwhile chop the tomatoes, parsely, mint, spring onions as fine as you can. Ottolenghi says to use a large very sharp knife and chop the parsley no wider than 1mm. Place the soaked bulgar in a bowl. Add the sliced tomatoes, shallots, parsley, mint to the bowl. Next, add the allspice powder, stir it in nicely. Add half of the lemon juice, salt and pepper. Stir it all in, taste and adjust seasonings, adding more lemon juice, salt or pepper as may be required, taking care not to over salt the dish. Add the olive oil, stir it in and serve the Tabbouleh immediately. Thank you, Sasmita! This is one of my favourite salads and today Ive again got a bunch of parsley so that I can make Tabbouleh soon! Thank you Veena! I became comfortable with this cuisine, by cooking from Yotam Ottolenghi’s cookbooks! This green salad looks so appetizing.This bowl makes a complete meal .Levantine cuisine is new to me as i am yet to try the dishes.Lovely share. Thanks for the detailed write up. Thanks a lot, Preethi! Most of the recipes in this cuisine are easy to make and use fresh produce, healthy and nutritious too. I love to grab tabbouleh of that platter, it sure looks like a happy lunch to me. Loved rereading your detailed write up about levantine cuisine and tabbouleh. Thanks for coming up with a completely new recipe. Salad sounds so healthy and delicious. For me a bowl full of this salad is perfect for lunch. Comforting and filling. Awesome share. Thank you so much, Sujata Roy! As I lunch mostly on salads, I need to be innovative and mix and match ingredients! Beautiful write-up Sujataji, enjoyed reading it word by word..and an equally beautiful and healthy salad recipe. A wholesome filling meal full with fresh flavours mint, parsely and lemon and all spice!!. Lovely share!! Thanks so much, Swaty! I still have to find out why only flat leaf parsley is considered in the authentic recipe and not the curly leaf one! The salad was delicious and I will be making it often! SujataJi, What I have read and personal experience is that flat leaf parsley is much more flavorful than the curly one. Also the curly leaves are thick and leave a slight bitter after taste, so I too don’t use it much. Will surely love to know if there is any other reason for using flat leaves one.. Thank you! Makes a lot of sense. I will explore further too! The salad looks tempting as well as healthy. I heard about Bulgar for the first time. Had to google search to know more about it. Salad looks refreshing and will try it for sure. Thank you, Vandana. Dalia is an option to use instead of bulgar (of course the taste and texture are different) as we don’t get bulgar easily in India and it is expensive, but the daliya needs to be cooked with less water so that it doesn’t become sticky. This day and age is definitely not for authentic traditional recipes. Most of the dishes worldwide are not adapted according to availability of ingredients and tastes of the people. Even within the Levantine Countries their dishes vary with some ingredients. I love tabbouleh and yours looks so inviting with all the parsley and mint. Its definitely a meal on its own. Totally, Mayuri! And the availability of ingredients is an issue, definitely, creating variations of the original recipe! Thank you for the nice words about my Tabbouleh post! I love the way you went into deep researching for an authentic recipe to recreate. Truly shoes your passion for cooking and blogging di ! My dish for the Levantine cuisine is cooking up today, all thanks to you. Anyways , this gorgeous salad sounds so very flavorful and I would love to have it as a mid day snack. Thank you Poonam! This is one cuisine I can never have enough of! Absolutely loved your write-up, Sujata! Brilliantly done – great going! Thank you so much, Priya. Ive been using couscous for a long time, but only now trying out bulgar, as it is not easily available except at Food Hall and online from amazon. So, this is where the next theme draws influence from? Hmm.. Super excited to cook but more than happy to see a lovely green loaded salad. A hearty lunch for weight watchers. PS – Tabbouleh and Rasam comparison had me in splits. Loved it! Spot on! When I was browsing and reading up for this post, I thought I should suggest it for the next theme, as it has a wide range of healthy veg and vegan recipes. And of course, it is one of my favorite cuisines! The salad was lovely! You are absolutely right, Kalyani! It was this post which inspired the Levantine cuisine theme! The mint does add its special flavour to the salad, as just parsley doesn’t do the trick! As for the tabbouleh – I was amazed at the numerous recipes, each varying from the others in one way or another!